The Eucharist is “the source and summit of the Christian life.” In the blessed Eucharist is contained the whole spiritual good of the Church, namely Christ himself. At the last supper, on the night he was betrayed, Jesus instituted the Eucharistic sacrifice of his Body and Blood. The Greek word eucharistein means thanksgiving. We also call the Eucharist Holy Communion because by this sacrament we unite ourselves to Christ, who makes us sharers in his Body and Blood to form a single body. We are united to Christ and with each other. During Mass, the bread and wine, by the words of Christ and the invocation of the Holy Spirit, become Christ’s Body and Blood. We welcome all who would like to join us for Mass. We ask that only those who share our Catholic belief and faith receive Communion. You are welcome to join our communion procession even though you are not receiving the Holy Eucharist. As you approach the priest or Eucharistic Minister, simply raise your right hand as a sign of faith and they will pray a blessing over you. Children not receiving the Holy Eucharist may also raise their right hand and receive a blessing. Wednesdays 8:30 a.m. to 6:15 p.m.
Every Wednesday, following the 8 a.m. Mass here at Holy Family Church, there is Exposition of the Blessed Sacrament. 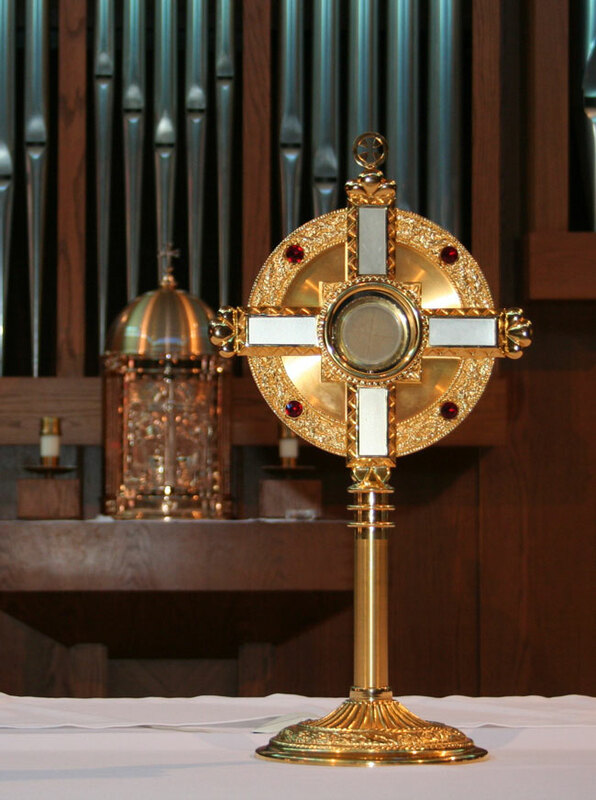 Eucharistic Adoration takes place during the day, until Benediction at 6:15 p.m. This is a wonderful time for private prayer and personal encounter with the Lord. Pray the Psalms or the Liturgy of the Hours. Recite the “Jesus Prayer.” Say “Lord Jesus, have mercy on me, a sinner,” repeatedly as you quiet your heart and mind. Read the life of a saint and pray with him or her. Pour out your heart to Christ and adore Him. Ask for forgiveness and intercede for others. Sit quietly and just “be” in the presence of God.